Author theQuotes.mePosted on August 10, 2018 May 18, 2018 Categories Actors, TV Shows, WestworldTags 3D Printed Human, Adison LaPenna, ai, Akecheta, Android, Angela, Angela Sarafyan, Anthony Hopkins, Armistice, artificial intelligence, Bad Robot, Beautiful, Beauty, begin, Ben Barnes, Bernard Lowe, Blaine Bellamy, Boualem Hassaine, Brian Ames, Caitlyn Knisely, Carly Wray, Characters Welcome, Charlotte Hale, Chestnut, Choice, choose, Christopher May, Claire Unabia, Clementine Pennyfeather, Clifton Collins Jr., Cole S. McKay, colors, Confederado, Confederado Amputee, content, Craig Reed, Cruel, Dead Townsman, Delos, Delos Executive, Dolores Abernathy, Dolores' Horde, Donald Pardue, Dr. Robert Ford, Ed Harris, El Lazo, end, Episode 2, Eric Shackelford, Evan Rachel Wood, Fancy Townie, full of splendor, future, futuristic, Gaku Space, Ghost Nation Native Warrior, Giancarlo Esposito, Gina Atwater, Harried Tech, Have you ever seen anything so full of splendor?, Hector Escaton, Hip Man, Homesteader, humanoid, Ingrid Bolsø Berdal, Izabella Alvarez, Jackie Moore, Jacobson, James Delos, James Marsden, Jason Lanier Brown, JD, Jeffrey Scott Basham, Jeffrey Wright, Jimmi Simpson, Jimmy Simpson, Johanathan Nolan, Jonathan Nolan, Jonathan Tucker, Juliet, Kerrington Fier, Kilter Films, Lawrence, Lawrence's Daughter, Lee Sizemore, Linda Victoria Romo, Lisa Joy, Little Girl, Logan, Maeve Millay, Major Craddock, malfunction, man in black, man vs machine, Management, Mariposa Girl, Mark Kubr, Memorable Quotes, mind boggling, never give up, Pardue Brother, Pardue Brother #2, patience, Patrick Cage, Paul Riley Fox, Peter Mullan, Phil, PMC, remake, retirement party, reunion, robot, Rodrigo Santoro, Rough Customer, Sci Fi, Scott Peat, Season 1, Season 2, see, Senion Management, Senior Executive, Shantiel Alexis Vazquez, shekspere, Simon Quarterman, Sophia Rose Nikolov, splendor, Talulah Riley, Teddy Flood, Tessa Thompson, Thandie Newton, theme park, Truth, TV Show, Vendor, Vincenzo Natali, Violent, Violent delights, violent delights have violent ends, violent ends, voice over, Warner Bros., Westworld, Westworld Quotes, Wiley M. Pickett, William, World, year 2016, year 2018, Younger Man, Zahn McClarnonLeave a comment on Have patience. Slippin’ Jimmy sharing some thoughts from high school when asked if he plays guitar. 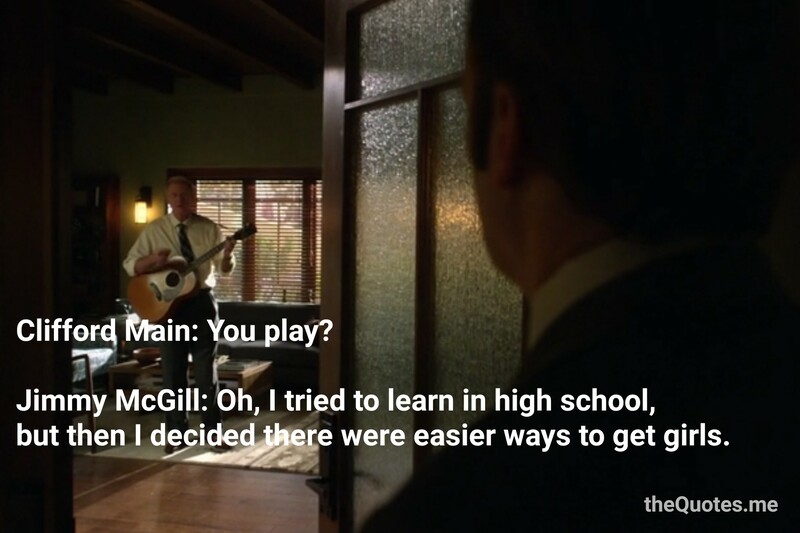 Jimmy McGill: Oh, I tried to learn in high school, but then I decided there were easier ways to get girls. 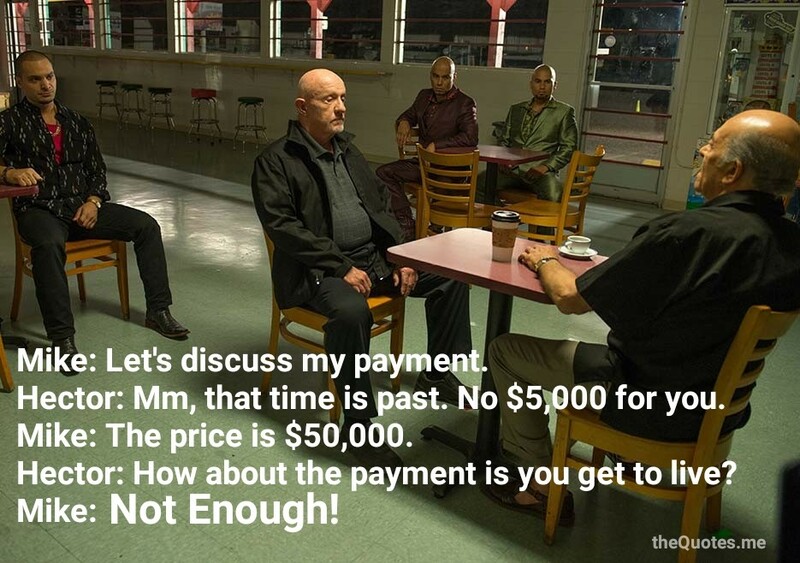 Author theQuotes.mePosted on August 8, 2017 August 27, 2017 Categories Better Call Saul, Jimmy, TV ShowsTags Better Call Saul, Clifford Maine, Cobbler AMC, Episode 2, Fictional Character, Guitar, high school, James McGill, Netflix, Pick-up line, Saul Goodman, Season 2, Slippin' Jimmy, TV Character, TV ShowLeave a comment on You Play?